Natureline is proud to present this incredible offer while saying HELLO to these hot days of summer. Choose to buy from a vast range of Hello juices with no sugar added and a whole slection of fruit drinks. Collect any 6 HELLO 1ltr or 2ltr empty cartons and exchange them with a FREE beach towel from your favourite grocer or supermarket or directly from Nature Line Ltd., 30, New Street, Qormi. Offer is valid until stock lasts. 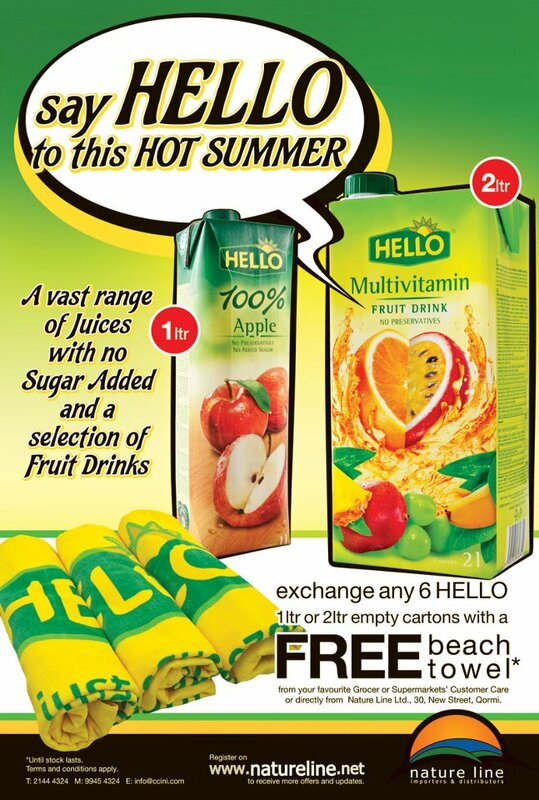 Enjoy your summer and benefit while drinking Hello juices and fruit drinks!